Oldham Roughyeds head coach Scott Naylor is hoping their Challenge Cup run will provide finances to help the club in the long term. 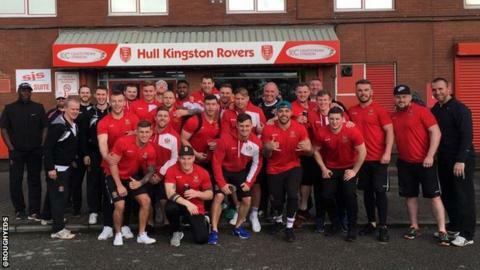 The Championship part-timers won 36-22 at Super League side Hull KR on Saturday to reach the last 16. In the Challenge Cup, teams split the income that is taken on the gate after the home team has claimed expenses. "Let's be honest, the Challenge Cup is all about trying to get as much money as we possibly can," said Naylor. "Do we go for the win [in the next round] or do we go for the financial aspect? I'd love to win the next round and the round after that as I don't like losing games - but let's be realistic." The Roughyeds have had to move to play at Stalybridge Celtic's Bower Fold ground this season after promotion from League One, as their Whitebank Stadium did not meet Championship regulations. "The money will help us massively and that's what we're desperate for," Naylor told BBC Radio Manchester. "That would then kick us on for next season and the season after, and then maybe we can start talking about trying to win things. "Right now we're a club that needs a few quid and the next round will give us that hopefully."